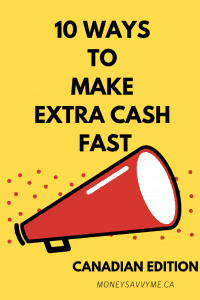 Need extra money fast? Here’s 10 ways to make extra money this month! Who doesn’t love some extra money? Whether you’re looking to pay an emergency expense, treat a date to a great night out or fluff up your savings, extra money can be made quickly and easily! So this might not be the fastest route, but many survey sites give you a nice bonus just for joining and if you’re willing to put in some time, you can pull in some serious extra cash by telling advertisers and researchers what you are interested in. Treasure Trooper – another awesome get-paid- to site, with tons of surveys, offers and games! Plus there’s an awesome chat feature where you can connect with other members and win prizes! Oh ya, they also pay out in USD, which is pretty awesome considering the current exchange rate! Join Treasure Trooper Here! Legerweb – This site is exclusive to Canadians, and has lots of great (often) high paying surveys. You can login into the dashboard to answer them, or just wait until you receive notifications of new surveys in your email. Read about Legerweb here! Asking Canadians – Another exclusively Canadian site, but this one pays out in your choice of Aeroplan, Hudson Bay or Petro Points. A nice way to push up your reward points to the next level and cash out. Learn more about Asking Canadians here! Sure, you’re trying to earn more money, but you still have expenses and as such you will likely have receipts! Guess what, there are companies out there that will pay you for pictures of your receipts! Checkout 51 – I’ve been uploading receipts to Checkout 51 and redeeming for cheques for quite some time now. As you can see from my screenshot that as of publishing, I have earned $532.80 from Checkout 51! Wowzers! It’s pretty easy to use, simply look at the offers that are available (updated every Thursday) and if you have bought something on the list, simply take a picture of the receipt and upload it to the app. Once your receipt is approved, you will receive whatever the listed rebate is into your account and then can cash out once your account reaches $20. Sign Up for Checkout 51 here! Caddle – Caddle works pretty much the exact same way as Checkout 51 where you upload receipts with proof of purchase to receive a predetermined credit. But they also have daily surveys, and many product surveys that you can earn money by completing too. On top of that, Caddle also often has offers that pay you to engage with companies’ social media! You can cash out once your account reaches $20. Join Caddle Here! Swagbucks – Yup, Swagbucks has added a receipt uploading rewards feature! You can find it in the Answer app, once you download it to your mobile device. Most of the stores currently offered are US only, but I have found that Canadian Costco receipts work and will give you a couple more Swagbucks towards your daily goal! No need for specific purchases, the receipt just needs to be from one of their partnering stores. Receipt Hog – This is a pretty cool app that allows you to simply upload pictures of any of your receipts. Some receipts give you coins that can be redeemed for Paypal or gift cards and some give you chances to spin a wheel for more coins. There are also all sorts of bonuses that you can earn and boost your payout. You can cash out at $5, but you get discounts the higher you go in reward values. Coinout – Another great site where you simply take pictures of your receipts. Each day there is a different limit as to how many receipts you can upload, but with no cash out threshold (except with Paypal) it is handy for when you want to be rewarded right away. Read my Coin Out Review here. This is the year of tidying up, right? I mean everyone’s going nuts of Marie Kondo and rightfully so! As you go through your stuff and make your keep and get rid of piles, take a look at the condition of the get rid of stuff. Then put it up for sale on Kijiji or Facebook (see which I prefer here). Not only will your house have better energy, but your bank account will be a little fuller. There’s tons of great gig opportunities out there and Instacart is by far one of my favourites. I looked into rideshare programs, but really didn’t want to have to deal with people messing up my car and having to make small talk with strangers. Then, I saw Instacart – where you literally get paid to grocery shop for people! After you are approved, simply login into the app, chose the hours you’re available and then wait for jobs to pop up once your shift starts! Make sure you’re friendly, helpful and accurate and some people will even tip you! Get paid weekly with direct deposit. Use promo code EFERNANDEZ5018D when signing up here! I’m not joking. Head over to Treasure Trooper and get started on raising some dragons! You can sell 1 dragon a month and they start at $5 a piece. How do you build your dragon business? Simply complete tasks, participate in chat and contests and answer surveys to give you the dragon scales you need to raise, breed, battle and sell your dragons (oh ya, you also get paid in points for gift cards and actual money for some of those activities on top of getting dragon scales)! Join Treasure Trooper here! We are in the midst of a deep freeze in Southern Ontario at the moment, after a brutal snowstorm that left several inches of snow piled high. This is a great opportunity for the entrepreneurial who can withstand the cold and some physical labour. Simply grab a shovel and start knocking on doors. Set a rate and people will likely not only gladly pay it, but also offer their snowblowers! Of course, in the summer, you can also grab a power washer and wash windows, or a lawn mower and cut grass. People are lazy and don’t want to do these kinds of home maintenance. More books than brawn? Hop onto Facebook or Kijiji and offer tutoring services. Or, for those who love little kids – advertise baby sitting services. Every time someone offers babysitting in my local moms groups, there are at least 10 people who reach out on the post (who knows how many express interest through private messages). This year is all about tidying up and getting organized. Learn the Kondo method and start offering your services to help other people organize their home! Like to clean? Use your coupons to get some great deals on cleaning supplies and offer home cleaning. In my area, the going rate is $25-$30 hours with a 4 hour minimum. Quick cash for clean you! Ya, I’ve mentioned Swagbucks a few times, but there really are so many ways to earn with it! One of my go-tos for building up Swagbucks is by watching videos. I run the Watch page on my computer with the video toolbar in a new tab and run video apps (i.e. Lifestyle TV, Sportly, Entertainme) on my phone while I’m plugging away on surveys or doing whatever other work that necessitates my computer. You do have to pop back to the pages every few minutes, but not that big of a deal if you’re like me and have ten tabs on the go at any given time! Did you know that many companies will pay you simply for signing up? No joke. Of course, it’s typically a jumping off point and you need to make more money before cashing out, but it’s a great way to hit the ground running and get closer to cashing out. Treasure Trooper – Get $5 when you touch someone’s dragon egg and sign up through the dragon portal (yes – you’ll get to make money playing with dragons too)! Click here to start your Treasure Trooper account with $5! Swagbucks – Sign up for Swagbucks and once you complete 300 points ($3 which is SO easy to do) before the 1st of the following month, you’ll get a bonus $3 added to your account! Since you can cash out at as low as $3 – you could get 2 rewards! Mylo – Link a bank account and start rounding up your purchases into savings! Once you’re linked and funded, you will receive $5 into your brokerage account when you sign up here! Drop – Collect points for purchases at select stores and redeem for great rewards! Get $5 added to your account (enough to cash out) when you link your card(s)! Sign up here and use promo code 9efqb to get your $5 sign up bonus! 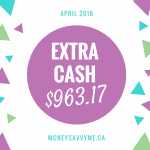 Ebates – Sign up for both Ebates.ca (Canada) and Ebates.com (Canada & USA) and get $5 added to your account! Then earn cash back each time you shop online! Ebates pays quarterly with a minimum balance of $5.01. Mobee – This awesome app connects you with mystery shopping opportunities right on your phone! These simple tasks can be completed quickly and since they are displayed on a map, you can do multiple missions near each other! Cash out your rewards for as low as 350 points and donate to charity or choose gift cards. Join Mobee here and use code 1QX9 when signing up! Shopping online? Might as well get some cashback on your purchases. Sure, if you need money now, you may not be in position to be buying things, but if you have some urgent must haves, shop through one of these cashback sites to put money in your pocket. A dollar saved is a dollar earned, no? Ebates (.ca/.com) – Even though I’m in Canada, I use both Ebates.ca and Ebates.com. This is simply because many of the sites I shop are available on both platforms and I’m only about 45 minutes from the border, which means I cross border shop often. I try to use Ebates.com as much as possible simply because they payout in USD, which is more than the Canadian dollar at the moment. It’s super easy to use, simply login into your account, click on the store that you want to shop at and Ebates will do the rest! It does payout quarterly though, but fortunately, it only has $5 threshold. Swagbucks – If you’re earning Swagbucks for surveys, completing tasks, watching videos, playing games or signing up for offers, you might as well start earning for your shopping trips too! When you’re ready to shop, simply click on the shop button and select the store you are interested in (if you have the Swagbucks extension, simply going to the store’s site will often prompt the Swagbucks cash back to activate). It can take up to 30 days to credit.